Crack open a can of Lone Star, grab some gooey BBQ and pop in this cassette featuring some of the best garage rock bands in Austin, Texas. Cowabunga Babes vs. The Zoltars fuses the energetic, summertime jams of the (almost) all-girl Cowabunga Babes and the introspective, snarky tunes of the Zoltars into a split release that’ll send some good ‘ol distortion rippin’ through your speakers all in less than 18 minutes. 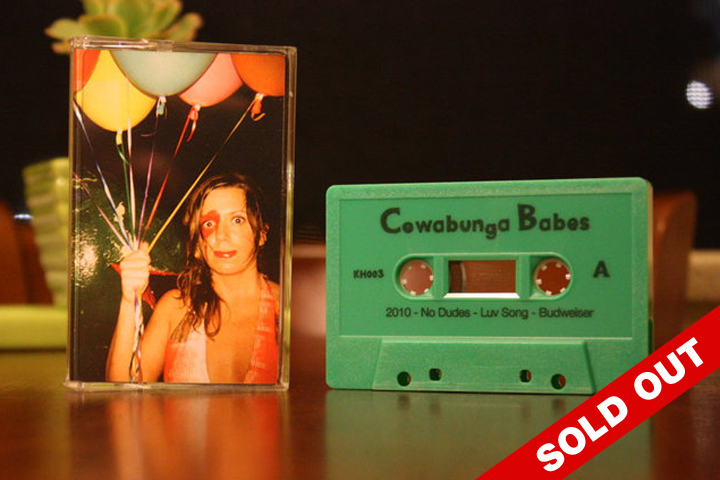 Cowabunga Babes vs. the Zoltars fits right onto a brilliant bright-green C18 tape. Each copy is individually hand-numbered and limited to 100 copies. Like all Kill/Hurt releases, this tape is professionally dubbed, packed and shipped by us! Browse the Release archive. This entry was posted in COWABUNGA BABES, COWABUNGA BABES/THE ZOLTARS, Sold Out, TAPES.